Cumbrian sheep farmer Brian Armstrong cannot remember a time when things were worse for his industry. Brian Armstrong has cut his prices. Picture by Jennifer MacKenzie. The market has collapsed and the price he receives for his lambs has plummeted by 30%. He has also watched friends of his unable to bring their lambs down from the hills because of movement restrictions. Some of them are now struggling to find the money to feed animals they never expected to still own. "It might have been as bad for our fathers back in the 1930s, but this is definitely as bad as I've ever known it," Mr Armstrong says. "I feel this must be a tipping point. "Farming has become totally unsustainable and something has to be done. The government has to decide whether it really wants a farming industry in Britain or is just prepared to let it die." Mr Armstrong keeps 400 ewes on his farm near Lazonby in Cumbria and produces prime lambs for sale to supermarkets. He usually sells them for £45 to £47 each, but now he is lucky to get £32 to £34. The reason for the price drop is a glut of sheep on the domestic market, stuck on farms because farmers cannot export as they usually would. "When foot-and-mouth was found, they put the movement ban in place which was quite right. Nobody argues with that. "But what immediately happened was we lost our export market and that takes the strength out of the entire sheep industry. 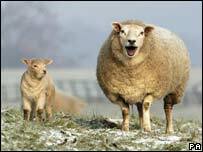 "There are more sheep in the UK because they're not going abroad. More supply means the supermarkets aren't prepared to pay as much." Some farmers are having trouble selling at all because of the oversupply. Others that could are unable to because of the movement ban. Combine that with a big increase in the price of feed - about £50 a tonne - and Mr Armstrong says the situation is unsustainable. "Farmers are stuck with sheep and it's hard to find the money to keep feeding them." In Scotland, this situation has prompted extreme measures. Last week, plans were announced to dispose of 250,000 lambs at abattoirs for just £15 each. The animals have not been sold because of the export ban and without a cull they face a slow death from starvation due to lack of grazing and the onset of winter. There are also fears that a similar cull might be needed in Romney Marsh in Kent. Sheep grazing there cannot leave the south-east because of foot-and-mouth and bluetongue restrictions. Ian Bell, director of farming charity the ARC-Addington Fund, said the disposal was a sad inevitability. "It's not very consumer friendly, but sadly I think it's probably a necessity. The level of demand we're seeing for help with feed costs is going up every day." The ARC-Addington fund was set up following the 2001 outbreak of foot-and-mouth and offers small hardship grants and emotional support to farmers. 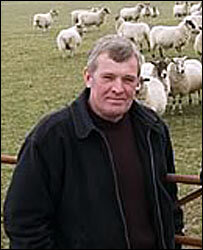 Mr Bell said: "If you wanted to do harm to the British sheep industry you couldn't have picked a better time. "Three weeks ago was the moment for bringing lambs down from the hills, but in many places there was no movement possible whatsoever. "Some farmers have done deals to sell them forward which helps with a bit of cash, but it doesn't help with the fact they cant be moved and have to fed in the meantime." There is some light on the horizon. Farmers in the bluetongue control and protection zones are able to take their animals to market and slaughter houses outside the zones as of midnight on 14 October. And pending any change in circumstances, Defra plans to lift the foot-and-mouth protection zone in Surrey on 17 October. This will end all movement restrictions in England, apart from those in the area still at risk in Surrey. Mr Armstrong feels the lifting will be of some help, but not enough. "More than anything farmers have lost their confidence," he says. "They don't know what the future holds. "We need to get the message across to the government, retailers, processors and so on that something has to change. "If we're going to have a farming industry in this country in the future it's got to be more sustainable and more valued."